Karma hit me. I’m sick. I’m coughing, sneezing, sniffling, hacking and whining like a little crybaby. My mom says my apartment is too clean – I disinfect way too much, leaving my immune system vulnerable to evil rotten germs. “Why ya gotta clean so much? You’re making your immune system weak!” That’s her theory. Try having OCD and hearing those words. I cringe. Antibacterial gels are in each room, just in case you need an extra squirt or two or three or four… I go above and beyond the call of my sanitary duties. At night, the sink has to not only be disinfected and “dry” – it also has to have a fresh wedge of lemon in the drain to kill any remaining germs leftover from whatever. It’s my deranged way of defining health. My mom called me this morning and asked me how I was feeling. I tried hinting to her that I needed her delicious miraculous chicken soup cure, but she didn’t pick up on it. When I decided to bluntly indicate that her chicken soup heals me, she went into defense mode and screamed out, “I don’t have a chicken and it’s too cold out!” God I miss home. I even made a cry for help on my Myspace page and set my mood as “sick”. 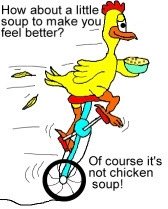 I also put my status message saying, “Deb needs one of her friends to bring her chicken soup! Any takers?? ?” …Not. one. response. Do unto others dammit!!! Guess that’s not working so great. I gotta try a different method here. Recently, my nephew was diagnosed with the Fifth disease. I had no idea what that was to begin with. Apparently, it’s flu-like symptoms accompanied by a rash. They have to actually sort them out by name. When I was growing up, it used to be called 'having a cold or flu'. What the hell changed? More and more kids are in daycare and exposed to other children. They catch it, and then throw it right back at another kid as well as their parents and of course…aunts. It just never ends. I stay away. I love them dearly, but for the love of GAWD --- put those cute little tykes in a bubble! I don’t mean to kvetch so much about this – but I’m a huge whiny baby when I’m sick, so bear with me. The fainéant side of my sickness will rear its ugly head and the post will soon come to an end…I promise. What concerns me most of all is the lack of sensitivity that others display while being sick by shaking your hand upon meeting them. They’re holding a tissue in one hand and extending an olive branch with the other. Are you crazy? I always shoot back with a, “Oooooh, yeah, well see, I have a cold and I don’t want to get you sick,” even though he’s the sick pup trying to infect you. There should be a rule about shaking hands this time of year. I have that rule all year round – it’s more of a kosher-wannabe fantasy I’ve always had, but that’s neither here nor there. I never see my Hasidic friends sick. There may be something to this! ...YES YES? What about Bugs Bunny? He had OCD. Why do you think he kept telling the big gorilla to stop breathing in his cup? OCD. Of course it makes sense now, which is probably why he’s my favorite cartoon character of all time. I will conclude this long-winded self-pity cry for help type of post with this: if you’re in the New York area and feel this strong urge to bring me some chicken soup – I will be eternally grateful. None of that cheap broth stuff either. Remember, do unto others, right?